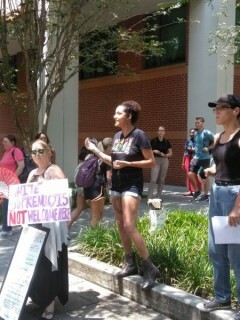 Tampa SDS rallies against racism on campus | Fight Back! Tampa, FL - Members from Students for a Democratic Society (SDS) from the Universities of South Florida (USF) and North Florida (UNF) held a Black Lives Matter event, Aug. 30, at the campus of USF. The rally was in direct response to the numerous instances of racist incidents and white supremacy on campus, including the placement of white-supremacist flyers on the MLK Jr. statue at the university, as well as the writings of racial slurs in a residential hall. The lack of acknowledgment and confrontation towards these problems by university administrators prompted members of SDS to demand accountability from USF. Community and student activists spoke, addressing the revocation of the Temporary Protected Status for Haitians, and the role and militarization of police in African American communities. Activists of UNF SDS shared their experience of getting a grand wizard of the KKK suspended indefinitely from the university. This event also spread awareness for the upcoming trial of Jason Van Dyke, the Chicago police officer who shot and killed teenager Laquan McDonald. The Chicago trial is set to begin Wednesday, Sept. 5.